A Documentary by Gita Desai. 5000 years of knowledge presented in the visually beautiful film. 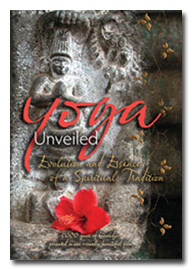 Yoga Unveiled : 2 DVD Set. Running Time 3 Hours. 15 Minutes. From the creators of Raga Unveiled this Stunning and Informative Documentary. Yoga Unveiled, is a breathtaking journey of sight and sound that illuminates the essence of yoga as its creators understood it thousands of years ago. Yoga ..... No longer an obscure discipline only practiced by mystics, yoga now occupies a central place on the world stage. Few practitioners, however, are aware of yoga's remarkable potential as a vehicle for personal transformation. Harnessing the colorful commentary of the most prominent yoga scholars, teachers and medical experts, Yoga Unveiled reveals how yoga began, tells the story of yoga's passage to the West, describes its numerous branches, recounts the fascinating biographies of the foremost yoga masters, and explores yoga's astonishing medical potential. Krishna Das, Dr. Herbert Benson, Edwin Bryant, Subhash Kak, Vasant Lad, Dr. Timothy McCall, Larry Payne, Pandit Rajmani Tigunait, Father Joe Pereira, Swami Sivananda, Dr. Martina Ziska, and Dharma Mittra. 1. What is Yoga ? 3. The Branches of Yoga. 4. The Passage from East to West. The life of Krishnamacharya, who preserved the ancient tradition of yoga and trained the greatest modern yoga masters, including his old footage. The biographies of Krishnamacharya's great disciples, Indra Devi, B.K.S. Iyengar, Pattabhi Jois, and Desikachar, including footage of each. The story of how each Yogi brought Yoga to the West. Insightful commentary about the place of yoga in the modern world. 6. Yoga and Modern Medicine. Yoga Unveiled is graced by the soulful music of Ashit Desai. You can visit Ashit Desai's Mind-Body-Soul Collection on-line at One World Trading. You will find an eclectic selection of his CD's devoted to meditation and spiritual awareness. Ashit Desai creates soul-searching divine music using traditional Indian Classical structures along with modern elements. Some recommended titles include: Divinity, Trinity, Eternity, Purity, Serenity, Mystical Om and Sacred Mantras of India. Cinematography: Sameer Sarkar, Dean Batchelder, Alison Hornbeek. Music: Ashit Desai, Michael Karp. Sound Edit and Mix: Mike Damon. Graphics and Package Design: Anu R. Sharma. For screening Yoga Unveiled for public viewing please Contact Raga Unveiled directly at ..... info@yogaunveiled.com to go through the Protocol.